The skipper Kane Williamson doesn’t require any change to do for now. While, England has shown its trust on the main and experienced players as expected. Eoin Morgan will go with the similar lineup at the Feroz Shah Kotla. Till now, NewZealand has played four games in the Super 10 stage and the team has adapted to all the grounds very well. Thus, there should not be any difficulty to getting adapt to Delhi’s pitch. On the other hand, England has an extra advantage as it has two matches here itself. The kiwis have more confidence and momentum. New Zealand’ bowlers whether they are spinners or pacers, all are doing well along with the batsmen who are able to score runs what are required to win. Except Mohali game, NZ had all the three matches where they batted first and defended the total very well. The wicket of the Mohali has been very slow. When South Africa played Sri Lanka on Delhi pitch, it had some grass, but spinners came out bowling well in the Super 10 final match. Even if the Delhi’s new pitch will have some grass, then too Mitchell Santner, Ish Sodhi, and Nathan McCullum can come out with flying colors. However, there is a little dilemma to take in Adam Milne or McCullum. The green tinage doesn’t necessarily mean that it would be good for pacers as they green wickets on which games were played previously turned out to slow. Except the above confusion, the rest of the team would remain the same. Martin Guptill will open the game with Henry Nichools. 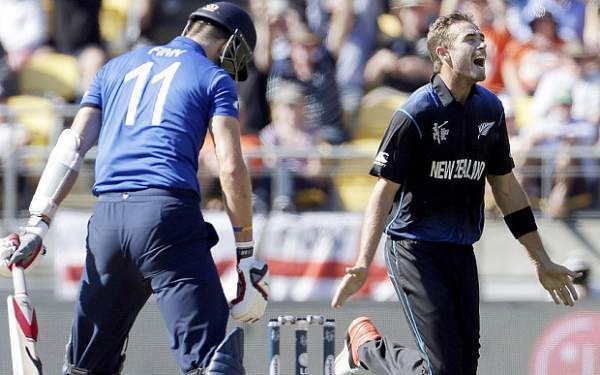 Southee and Boult may have to remain on the bench once more. However, Williamson can suprise England team by making some changes. England reached here after defeating Sri Lanka and batting first. So, English team would want to bat first after winning the toss to bring out New Zealand from their comfort zone. However, Angelo Mathews tricked bowlers and hit the ball all around the ground in the last game. Bowling lineup isn’t expected to change. The England’s spinners such as MOeen Ali and Adil Rashid faced some difficulties. If that happens again, Morgan would want his slower ones to control the day with a strong performance today. star sports network, starsports.com, hotstar, supersport, fox sports, espn cricinfo, cricbuzz, and others. England: Alex Hales, Jason Roy, Joe Root, Eoin Morgan (C), Jos Buttler, Ben Stokes, Adil Rashid, Moeen Ali, Chris Jordan, David Willey, Liam Plunkett. New Zealand: Martin Guptill, Kane Williamson (C), Colin Munro, Ross Taylor, Corey Anderson, Grant Elliott, Luke Ronchi, Mitchell Santner, Nathan McCullum, Ish Sodhi, Mitchell McClenaghan.